APRIL 23--Just in time for the final three episodes of "Friends," a California appeals court this week reinstated a harassment claim brought by a woman who worked on the hit show as a writer's assistant and claimed that she was subjected to an array of racial and sexual harassment, including enduring sexually explicit comments about the program's female stars. The court decision in favor of plaintiff Amaani Lyle, who worked for "Friends" during 1999, noted that, in depositions, writers and producers acknowledged the use of "sexually coarse, vulgar, and demeaning language in the workplace." 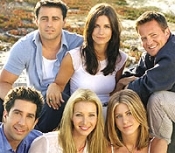 But that behavior, the "Friends" crew claimed, was a necessary part of the creative process and helped the show's writing staff to develop better scripts. But that might not explain the crude comments that some writers allegedly directed at "Friends" stars like Jennifer Aniston, Courteney Cox, and David Schwimmer, according to a declaration sworn by Lyle and filed in Los Angeles Superior Court.